Before I wrote this, I looked in a dictionary for the definition of the word "commencement". The dictionary states commencement refers to "the act or process of bringing or being brought into existence; inauguration, inception, incipience, initiation, leadoff, birth, dawn, genesis, start". Therefore, commencement suggests your lives are just beginning (and that is true in some respects). And by calling graduation ceremonies a "commencement", our institutions of higher learning have sorta decreed you can't really take that first step until they have conferred a degree on you. That's somewhat presumptuous but I guess by promoting the necessity and value of a degree, the schools can make a buck too. And there is no law against that. Essentially, I wish you two things: interesting people and interesting places. By that, I hope you find, see and keep both of those close to you for all your years. If you do that, you will lead rich, rewarding and fulfilling lives. And try very hard to understand the primary goal in life is to get very old. I know you won't agree with that statement right now but believe me you will one day. Put more simply, it is exhilarating to be both available and sufficiently lucid to give the eulogy at a friend's funeral. I know it is hard to resist the urge to follow the crowd. But do try to be your own person- so don't routinely and rigidly adopt all of the latest fads and trends. Find music, books and other hobbies you enjoy and make time for them. Endeavor to be a leader to others. Christine, you are a born leader. And there is much evidence you were born with the ringleader gene. That's the mischievous cousin of the leader gene. And that is a good thing- you love life and you show it. You will be a part of many groups and organizations in the next 60-70 years. Don't just go along for the ride. Give your best effort. Develop a reputation as an impact player. You can do that by making a strong personal impression and offering your support to the group's goals (i.e unforgettable PARTAYS, improve annual sales, beat the Villa Gorillas every other year). Be open-minded and learn to think for yourself. Don't be afraid to question the prevailing wisdom or latest news story. For example, a national news program recently ran a story that "the exercise done on Infomercials accounted for more than 50% of the total exercise done in America". That "news" story first originated as a spoof in a satirical magazine. The news network picked it up as "real news". I cringed and laughed when I heard it and wondered if any of you (had you worked on that program) would have thought to question the ridiculous premise. I believe each of you would have (Especially Gabe since he reads the magazine though until now he probably thought its "news" stories were legit). Take very good care of yourself both physically and mentally. There is a time to party and a time to "not party". Try to learn the difference way before you turn forty (so you can still run for President). It would be great if you could find a career that has all three of the above criteria, But you will survive and likely thrive even if you choose skills that only have two of the above criteria. And remember, there are no guarantees in life and life can be unfair. That's just the way it is. Bitching about bad breaks won't help. It will just make you very unpleasant to be around. Gabe, you could do anything. You just have to convince yourself you CAN do anything instead of finding reasons for why you can't do something. Remember you are most fortunate to have been born in this country. Though not without its faults, it is the greatest country on Earth. Always honor and respect the elderly though I know it is especially hard when they don't wear their hearing aids. Always value and cherish your family even when they ask a bazillion questions about your latest escapade. To all the wonderful, strong women I know and love. Like you know who and my two sisters and my nieces and my late mother and my father's mother and my favorite blogger, Ann Althouse, and many more. I rode my bike past this statue about 500 times I bet. 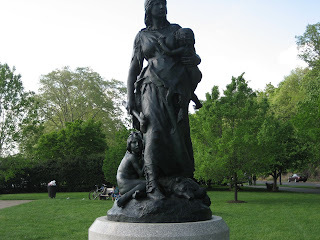 But today, it was Mother's Day, and I noticed this statue - really noticed it for the first time. It shows a colonial era pioneer (?) , perhaps she is an Indian woman, and she is brandishing an ax while protecting two children. She may be standing on a wolf she has killed in battle (it is hard to say exactly). Anyhow, the statue spoke to me today or maybe I was just looking for a reason to rest after after taking a spill on my bike (damn women cyclists heh) and ripping a half-dollar piece of skin from my knee. The statue said here is a tough independent American woman. That is the way I like them and IMO that is the way the best American woman prefer to be seen! [she ain't bragging about doing 120% at her job]. Raised in Philadelphia and born in New York City, sculptor John Boyle was descended from Irish stonecutters. When his father died, he quit school and worked as a stone carver and studied at the Pennsylvania Academy with Thomas Eakins. With money that he had saved, he then went to Paris from 1877 to 1880, and enrolled in the Ecole des Beaux Arts. During this time, to support himself, he painted portraits in Paris and also took decorative commissions in London. With regard to the Chrysler and the GM deals, many say the administration has set a new precedent for government by disregarding contracts. If so, why don't we penalize Congress members who have been in office for years and played a part in destroying the economy and our federal treasury? I suggest we reduce their pensions by 2% for every year they have been in Congress. For example, Arlen Specter has been in Congress for 29 years. Under my plan, if he retired today, Specter's pension would be cut by 58% (29 years x 2%). The MSM meme seems to be that the recession is bottoming out. Hmm. I read yesterday the US Postal service volume was down almost 15% in the 1st quarter of 2009. That tells me we have a long way to go before we hit the bottom of the recession. My overriding observation is the Obama administration has not done much to restore the confidence of the average American and especially the small business owner. Very few are planning to expand their business and evn fewer are starting new businesses.